I am excited to announce our 7th annual Frog and Reptile Macro Workshop in a new location, right here in Louisville Ky.!! Please join me and my good friend Adam Jones as we bring this exciting workshop to our hometown on June 1st and 2nd 2019. This workshop sold out early last year, so don’t miss this one of a kind event. It is going to be a spectacular time with all new subjects and many new animals that we have never had before. 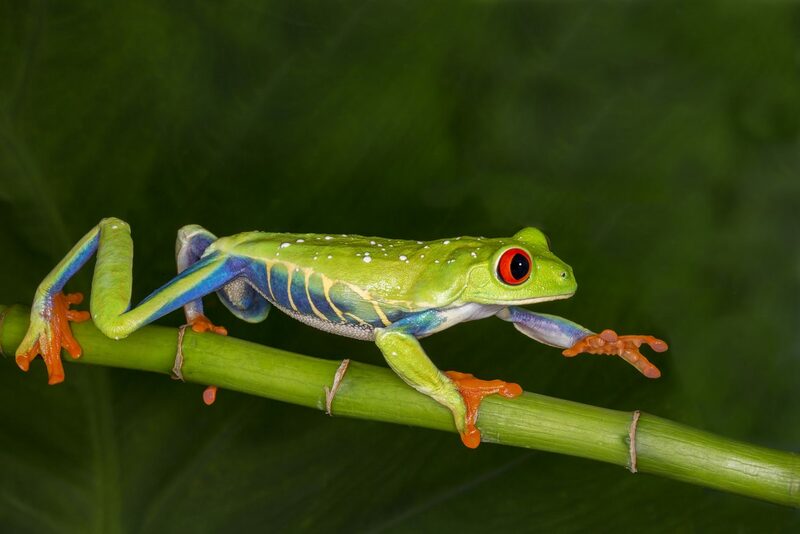 We will have the usual 30-40 species to photograph including, of course, the red eyed tree frogs and colorful dart frogs. Plus, I will also have my large collection of exotic insects, feathers and shells for great close up photography. Everyone will capture incredible images while learning to use flash like a pro at this private workshop! Several participants have won prestigious photo contests with the images captured during this macro workshop. There will be 6-8 shooting stations with real plants, flowers, leaves, and bark for natural looking background environments. The resulting photos appear to be taken in the wild – actually looking better than in the wild. You would have to travel to over ten different countries to find this array of colorful animals. Plus, we do not shoot through glass, so nothing is between you and the subject to interfere with image or lighting quality. You have total control: the lighting is perfect, the background is flawless, the colors outrageous, and you maintain complete depth of field to show all the stunning details. The weekend begins with a presentation on macro photography, lighting, and exposing flash perfectly every time. We will teach you how to quickly solve the technical challenges with this kind of photography, allowing you to produce your best macro images ever. So come join us for this exciting event right here in the heart of the Bluegrass! Lecture on macro photography and the use of flash for macro; two days of photographing some of the most intriguing macro subjects you’ll ever find, critiques on demand, and Photoshop techniques for the best images possible. Shared use of our two Canon MP-E 65 macro lens with Canon ring flash for 1x – 5x magnification close-ups for eye popping details, patterns, and eyeballs. Personal one-on-one help to make sure your camera and flash are set properly for perfect images. How to use flash perfectly when only inches from your subject. How to protect the highlights from blowing out in your pictures. The RAW workflow, and using Luminosity Masks for expert results. Equipment options for macro photography. Professional way to replace a background with Photoshop. Understanding lighting ratios with a ring flash. How to replace unwanted reflections in eyes and reflective skin. How to get maximum depth of field and sharpness for small subjects. The workshop is open to people of all skill levels and experience. The majority of people shoot with digital SLRs, but this is not a pre-requisite for attending this workshop. We suggest a Macro lens or some way of focusing very close, such as extension tubes or a Canon 500D diopter (this will fit any camera system and any normal or medium telephoto lens — you purchase it according to the ‘filter size’ of the lens you’ll be using). Contact us if you need advice on close-up accessories. A ring flash or a flash system with two small flash units on either side of the lens works great. If you don’t have one of these and don’t want to purchase one, contact us about very affordable rental options, or we will also have several light diffusers for speed light flashes to loan out. Constant light sources such as LED lights do not work well for this workshop. So, please contact us for equipment advice and suggestions. A tripod is not needed for photographing the frogs and reptiles, but may be handy for the still life subjects. Workshop is from 9AM to 4PM on Saturday and Sunday. Block of rooms on hold at a special rate if booked by 4/30/19. Registration will be on a first come first serve basis. Please notify us at least 30 days prior to the Workshop starting date in the event you are unable to attend a Workshop in order to allow another person to apply. In order to reserve your space at the Workshop, full payment is required. If you must cancel, there will be a $100 charge, from the date of booking, up to 45 days prior to the Workshop. After 45 days, the balance of the Workshop is non-refundable, unless we fill your spot. You can pay by check or online with credit card.